We’ve heard students say these things countless times. The best way to avoid choosing trap answers and making careless errors is being aware of what they are and recognizing them on the test. When answering reading comprehension questions, try to eliminate incorrect answer options one at a time. While this may seem like a straightforward task, since there is only one correct answer and multiple incorrect answers, it can be quite tricky as many of the incorrect answer options are worded in a way that makes them seem correct at first. These tempting answer choices are called “trap answers” and by knowing what constitutes a trap answer, you will have a much easier time weeding them out. Partially correct answer options contain statements that are partially supported by the passage and may address the question, but they also contain statements or words that are unsupported or incorrect. The entire option must be correct in order for it to be the answer. Be cautious of options that contain words like “never” or “always.” Additionally, beware of options that contain catchy words or phrases from the passage; you still want to make sure that the other parts of the option are correct. Avoiding this type of trap is fairly simple: read each answer option carefully and completely before selecting one. Avoid answer options that present facts or true statements that are not presented in the passage. Even if you know something is true, based on your outside knowledge, the correct answer will be based on information directly from the passage. Sometimes, certain answer options present statements that “just make sense.” Even if the statement is logical, however, if it is not presented in the passage and/or does not directly answer the question, it is not correct. This means that you should not have to try to justify, justify, justify— the correct answer can typically be supported and explained in one step by using information in the passage. If an answer option requires you to assume something in order to justify it, it cannot be correct. *Remember, assumptions and inferences are different. Assumptions aren’t based on evidence, while inferences are based entirely off of evidence from the passage. This type of trap answer is particularly tricky to spot when answering questions about a passage that is an excerpt from a story or contains characters. It is easy to form opinions when reading about characters and relationships. Be careful: you may agree with the statement, but you should never choose an answer option simply because you agree with it. Only choose an answer if it is supported by the passage. 1. Failing to FOIL when it is called for. Example: (x+3)2 does not expand to x2+9, but equals (x+3)(x+3), which foils to x2+6x+9. 2. Mixing-up when to cross multiply. Remember: only cross-multiply when working with a proportion, not when multiplying fractions. 3. Failing to get the negative answer when taking the square root. Example: if x2=9, x=3 or -3. 4. Reading inequality signs incorrectly. Example: x>y reads ‘x is greater than y.’ One way to think of it is that the alligator mouth eats the larger number. 6. Confusing whether 0 is an integer or a positive integer. Remember: 0 is an integer, but not a positive integer. 7. Mixing up the terms ‘mean’ and ‘median.’ Remember: the mean is the average; the median is the middle number. 8. Mistaking 1 as a prime number. Remember: 1 is not a prime number. 2 is the first prime number. 10. Using the decimal instead of the fraction when finding a remainder. Example: Although 7/5 = 1.4, the remainder is 2, not 4. 11. Failing to distribute through a negative in front of a parentheses. Example: -(x2-6x+4) becomes –x2+6x-4. 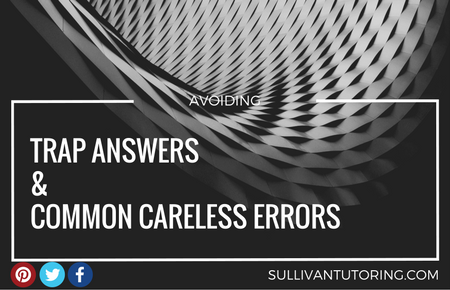 By avoiding these trap answers and common careless errors, you will have an easier time selecting an answer confidently. Confidence is crucial and it is a direct result of understanding the test ahead of time.